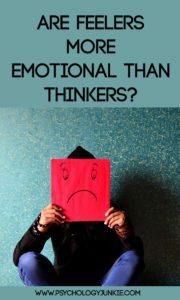 Are Feelers More Emotional Than Thinkers? Today I’m going to endeavor to clear up something that has long bothered me in the type community: the idea that feelers are inherently more emotional than thinking types. If you clicked on this article you’re probably thinking, “wow…I mean isn’t this obvious? Doesn’t everyone know feeling types are all about emotions and thinkers are all about cold hard facts and logic?”. Most people think this is a no-brainer. Most of the time novices in type (or even people who’ve been learning about type for a while) will see someone who’s emotional and instantly type them as a “feeler”. Here’s another quote from the official MBTI® Manual. I’d really like that to sink in. Because sooo many mistypes result from people typing others as feelers simply because they have irrational emotional reactions to things. That’s not what feeling is. Thinkers try to focus on impersonal logic, pros and cons, cause and effect when they decide. Feelers focus on values when they decide. Importance, worth, personal principles, morals, ethics. You can be emotionally immature and over-reactionary and be a thinking type or a feeling type. An ENTJ I once knew lost his temper all the time. He’d scream, yell, shout, throw things, and become very emotional. It was usually when he was stressed, overworked, and when his plans just weren’t succeeding. I’ve actually never seen anyone more emotional than this individual. This wasn’t because he was exerting his feeling preference, this was him using emotion. His feeling preference would have considered the worth of the situation, the personal impact of his choice, the relationships and circumstances of people involved in the situation. His outbursts had nothing to do with that. They were pure emotion and exhaustion. To be clear, a feeling type is just as capable of behaving in this way as a thinking type. Not all ENTJs are like this. Severe stress can make anyone irrational and emotional. An ENFP I know used to lose her temper regularly. She was overworked, stressed, had little time for herself, and was unhappy in her life. Was she exerting her feeling preference when she lost her temper? No. She was dealing with overwhelm, stress, and emotion. When she employed her feeling preference she was extremely considerate and thoughtful of everything she said and its impact on others. When I’m using my feeling preference in a healthy way I’m in tune with other people’s needs, their desires, their values. I’m in tune with my morals and ethics and the impact of my choices on others. When I’m emotional I’m simply emotional. I’m not using feeling in the Myers-Briggs® sense. Feeling in type theory is a decision-making function. I’m not deciding when I’m emotional, I’m simply being emotional. Someone who is highly emotional is just as likely to be a thinking type as a feeling type. But Feelers Are More Thin-Skinned, Right? This is another phrase that I hear a lot, that feeling types are more thin-skinned. Feelers do tend to take things more personally. Because they look at the meaning, worth, and impact of words they tend to have a harder time accepting criticism without looking for an underlying meaning to it. Just as the thinker looks for the cold, hard facts and truth behind an argument or problem, the feeler looks for the true motivations, relationships, and meanings behind words. Both types are looking for truth; the thinker is looking for a logical, functional truth, and the feeler is looking for a personal, value-based truth. “Who is this person really? What was their motive? What did they really mean when they said X,Y,Z?” As children especially feeling types may hear words like “you made a mistake” and interpret that as “I’m disappointed in you, you’re a failure, I don’t like you”. A thinking type who isn’t looking for an underlying motive, meaning, or emotion will be able to accept “you made a mistake” as separate from personal significance. Because feeling types are more sensitive to perceived intentions and motives of others they tend to take things more personally and be more affected by criticism. So if we’re talking about the ability to accept criticism, yes, in general feeling types will appear more thin-skinned than thinking types. However, thinking types can also be thin-skinned, but usually about different criteria. They can get hurt feelings when someone insults their logic, their plans, their self-esteem. They may be able to accept constructive criticism like champs, but they may react strongly when someone teases them or makes them feel incompetent. Each type, regardless of their thinking or feeling preference, has an ego and a way they want to be viewed and perceived by others. It doesn’t matter what personality type you have, if someone comes along and attacks that part of your ego, almost anyone will have an emotional reaction. For some, it will mean tears, for others it will mean anger, for others it will mean anxiety. Emotions are part of life for nearly everyone, regardless of their type. Are Feelers More Aware of Emotions Than Thinking Types? This all depends on the level of health of the feeling type. Generally, feelers try to keep a gauge on the emotional “temperature” of a room or person. Because they are looking for the worth, meaning, and significance of words they try to stay tuned in to the emotions behind words. There’s a certain “intuition” to feeling, and a desire to understand where the other person is emotionally coming from. This isn’t intuition in the typology sense, but more of a general emotional awareness. That said, unhealthy feeling types can use this strength in a negative way or they can be out of touch with the emotions of others because they are so self-absorbed that they haven’t developed their feeling function well. Feelers are just as capable of being mean-spirited as thinking types. One type isn’t inherently nicer than the other. Healthy feeling types will usually be compassionate and empathetic. Healthy thinking types will usually be logical and reasonable. Simultaneously, healthy feeling types will also have a balanced sense of reason and healthy thinking types will have a balanced sense of empathy. So hopefully if you’re reading this, you won’t instantly label the next teary, emotional individual you meet as a “feeler”. If we can all separate “emotional” from “feeling preference” we’d be in a much better place to type people accurately.